“We want to introduce to you one of our many selves, our compañero Subcomandante Insurgente Moisés. He watches over our door and with his voice is the voices of all of us. We ask you to listen to him, that is, to look at him as we look at ourselves, ” stated Subcomandante Marcos in an announcement on the new appointment. Visionary, military strategist, and organizer of the people, these are just some of the characteristics of the new Subcomandante of the Zapatista Army of National Liberation (EZLN). During the first days of January 1994 he was known as Major Moisés, later in 2003 he would fill the position of Lieutenant Colonel. Today [Feb. 14] he is presented by the Zapatista military leader and spokesman, Subcomandante Marcos, as the new Subcomandante of the insurgent forces. 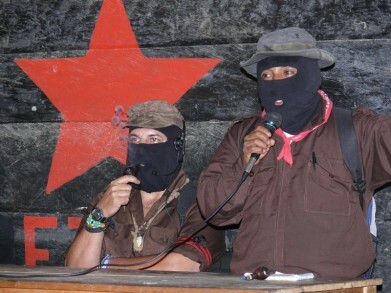 Moisés is one of the best-known insurgent commanders in the public life of the EZLN. On February 16, 1994, during the handover of General Absalon Castellanos – an EZLN prisoner of war – he appeared for the first time directing what would be the beginning of Zapatista public events after the start of the war. It was an act full of symbolism that ended with the exchange of the former Governor of Chiapas, known for his ruthlessness, for hundreds of Zapatista prisoners that were captured during the first days of the war. It was an act used to present an ethical movement that had sentenced him [the former governor] to carry the weight of forgiveness of those he had humiliated, imprisoned and murdered. “I come to hand over the prisoner of war, General Absalon Castellanos Dominguez. In short: The People’s Army, the Zapatista Army of National Liberation, has served as being the go between of warriors and rivals. The value of military honor is the only bridge. Only real men use it. Those who fight with honor, speak with honor.” These were the first words heard from the then Major Moisés, during one of the most emotional events of the last 19 years of struggle: the first appearance of the Zapatista support bases in Guadalupe Tepeyac. Subcomandante Moisés, a native Tzetal, came to the Zapatista organization, he says, in 1983. He started out by being sent to “the city” as part of his preparation and there, in a clandestine house, he met Subcomandante Pedro, who would become his commander, and Moisés his right hand man. Later he would become very close to Subcomandante Marcos. Moisés was one of those who went to organize the people in the Tojolabal valley in Las Margaritas. He went from village to village, family to family, explaining the reasons of the struggle. He is short in height but with an enormous heart and political vision, always wearing his black military hat, and wields a sense of humor that deeply honors the Tzeltal. Moisés was with Marcos when they had to withdraw after the government betrayed the EZLN on February 9, 1995. This is why much of the literature published during that period paints them as always being together, and [Moisés] as Marco’s squire. Yet, he was witness to one of the last meetings between Sobcomandante Marcos and Pedro, being Pedro’s second in command. Moisés recounted that the two commanders discussed the reasons for why they both wanted to go to war. Both said the other had to stay, if one fell, the other would need to take his place. Yet, they both left, the first went to seize San Cristobal de las Casas and the second Las Margaritas, where he was killed in combat that same morning. It was in that moment, with the insurgent troops without their commander, that the now new Subcomandante assumed command and control of the operation in the region. Later, after the handover of Gen. Absalom, the Cathedral dialogues and the opening up of rebel territory to civil society and the media, the vast majority of the Zapatista’s public activities moved to the Tojolabal valley, where Subcomandante Marcos appeared regularly alongside with then Major Moisés, Commander Tacho, and other military and civilian leaders of the region. During those first months and years, Moisés, in addition to his work within the organization, presented himself as a representative for most of the national and international civil society. He offered media interviews to explain the beginnings of the Zapatista struggle, the content and reasons of their peaceful and political initiatives and, later, the function and purpose of the Juntas de Buen Gobierno, of which he was a promoter of its antecedent, the Association of Autonomous Municipalities. In 2005, with the launch of the Sixth Declaration of the Lacandona Jungle, he was appointed by the General Command to be in charge of international affairs, in a commission known as “The Intergalactic”. During that period, while Delegate Zero (Subcomandante Marcos) traveled the country in the Other Campaign, the then Lieutenant Colonel received visitors from other countries and sent greetings to international meetings.